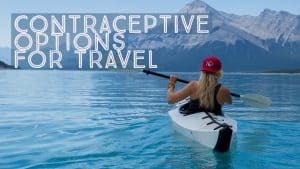 You know those beautiful destination lists you see on the internet ALL THE TIME, the Pinterest photos with the description “dreamland,” and the natural places you must see before you die? Well, that place is Cappadocia, or what I like to refer to as “the best place in Turkey.” I’m sure if you aren’t 95 or haven’t been hiding under a rock for the last 10 years you have at least navigated the internet and come across Cappadocia, whether you knew it or not. The photo usually has hundreds of hot air balloons soaring over unreal rock formations…ahh yes now it is ringing a bell! The place does indeed exist, and Cameron and I were fortunate enough to travel around the area for an entire week! 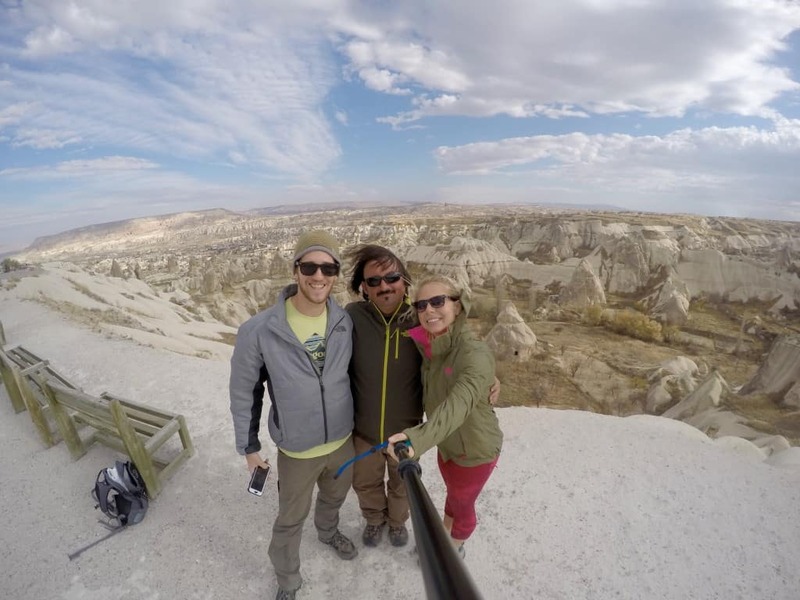 Surprisingly, doing Cappadocia on a budget was extremely easy. There are two airports that service Cappadocia: Kayseri Erkilet Airport (ASR) and Nevşehir Kapadokya Airport (NAV). 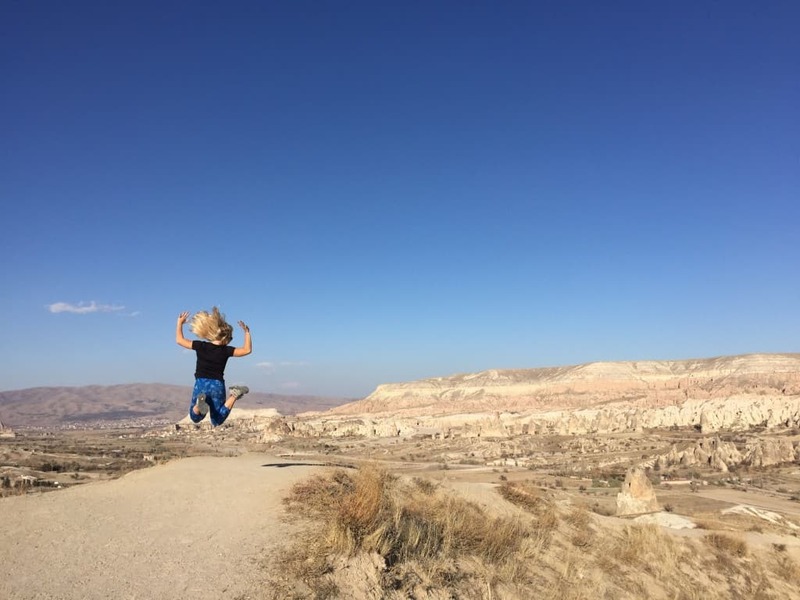 We took a $30 flight from Istanbul into Nevsehir with Turkish Airlines, which to us was a much better option than a long overnight bus for roughly the same price. NAV was a tiny airport that only has a few flights per day. Once you exit there are dolmus’s waiting outside to take you where you need to go. There are options to set this up in advance, but we had no problem arriving and telling the drivers that we were going to Goreme. The cost was 10 Turkish lira and took about an hour. 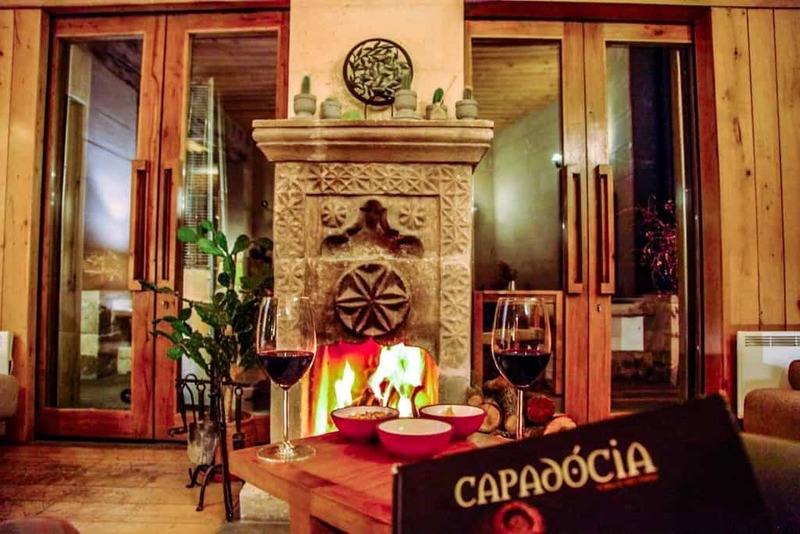 You can also take a train or bus to Cappadocia, we chose not to do this in the interest of time. We chose to fly after finding a sick deal on Skyscanner! 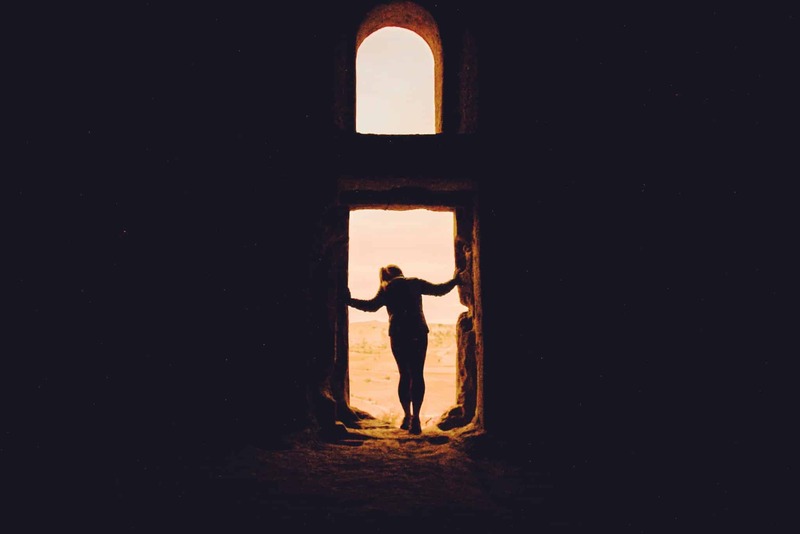 The “cave people” of Cappadocia are some of the nicest we’ve met in all of Turkey, and truly make Cappadocia the best place in Turkey. Quite regularly locals were inviting us in for tea and to chat. One local man that we met told us that we were free to go into his house (he left it unlocked) while he was at work and take a look around and enjoy ourselves! I know there have been reports in the past about theft and crime in Goreme, but we felt completely safe and at home. Is the same everywhere. Clay pot meals and lentil soup is what the area specializes in and cost about 25 lira for a chicken clay pot, small salad, and lentil soup. After a week here I think I can safely say that I never want clay pot chicken again. We got a brief break from the clay pot meals at Fat Boys Bar, which served a couple traditional western dishes for reasonable prices. Splurge alert: If you want to live a little more refined then check out Seki Restaurant in Uchisar for a nice glass of wine. A glass of house wine will run you about 20 lira, but the views are incredible and the wine is delicious. 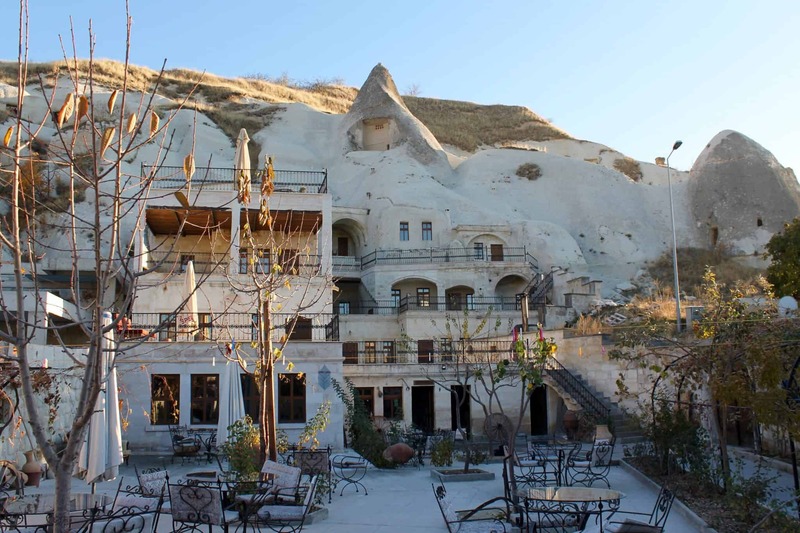 There are three main coffee shops servicing Goreme. Coffeedocia, Pasha Cafe, and Oze Coffee. We went to Coffeedocia because the name was cute…but it turned out to be extremely overpriced and average coffee. Pasha Cafe has a nice outdoor seating area with a fire, but prices were outrageous even by New York standards. We chose to get our daily caffeine fix and Oze Coffee, right in the center of town and even make specialty lattes for 8 lira. Varies with your budget. There are a few backpacker hostels that are very cost efficient and include breakfast. We spent 3 nights at Stay in Peace Hostel for 20 lira/night. 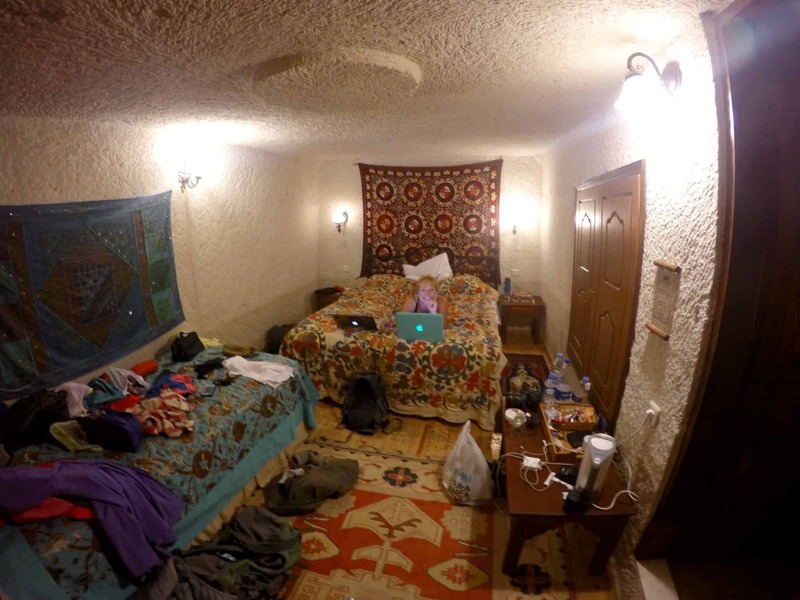 We then moved to a traditional cave hotel and got a basic double room inside a cave for 90 lira/night. Most accommodations in Turkey include a traditional Turkish breakfast. Turkish breakfast in the best place in Turkey? Perfect. Cappadocia is what you make of it. Of course, it can be done extravagantly, but as backpackers, we wanted to do Cappadocia on a budget. I will detail below costs, I must say that we were able to live very comfortably here while staying under our budget of $35 a day, just like many other Europe travel costs. 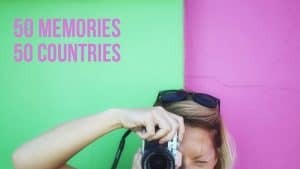 Breaking down some of the cost and options for activities to do Cappadocia on a budget, and also on the high end. All cost are per person. This is one of the number one things I wanted to do in Cappadocia, but for some reason, I didn’t do any research on it beforehand. We arrived expecting to be flown high up into the sky, but after we were quoted €100 (off season price) per person for 1 hour of ride time we quickly rethought. I’m sure it would have been lovely, but we can live off €100 for 4-5 days in some places. We simply could not justify this cost, and instead woke up at sunrise and hiked to sunset peak to catch the balloons for free. Which was one of the coolest things I have ever seen. 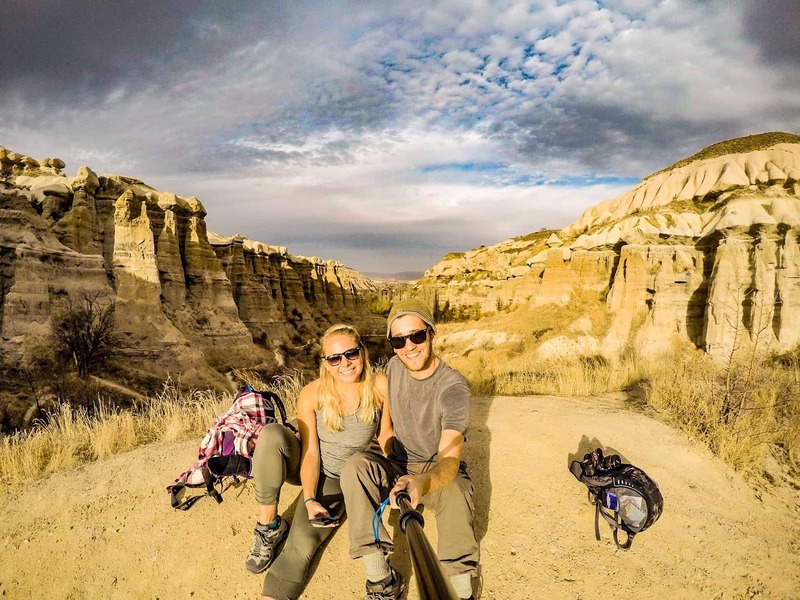 There are so many valleys to hike through in Cappadocia! We spent most of our days wandering through Rose Valley, Pigeon Valley, Red Valley, and Love Valley. All are incredibly unique and offer great hiking trails. Best of all – it’s free and a workout! 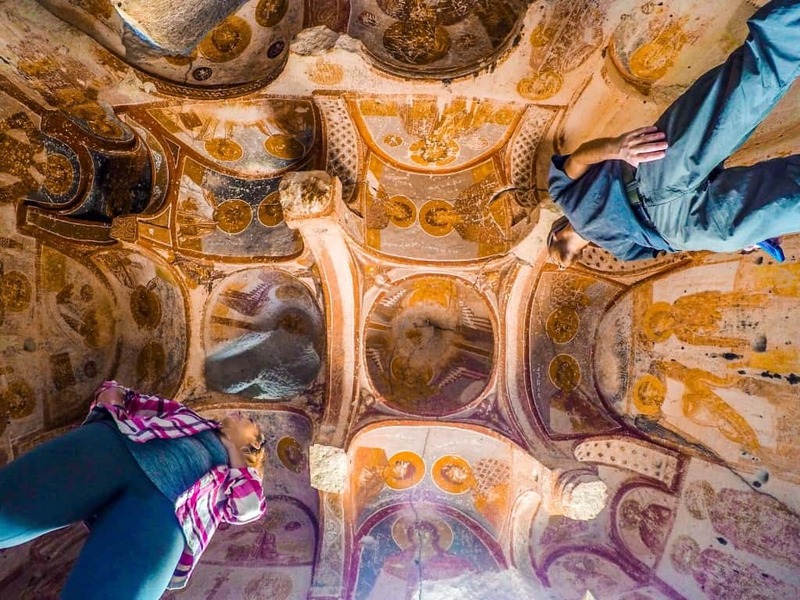 The cave churches in Cappadocia are some of the oldest in the world. You can find plenty of them just hiking around the valleys of Goreme. We chose to explore the churches on our own rather than go to the Open-Air Museum. The Open Air Museum is a UNESCO World Heritage List and boasts many churches side by side. We were told that the crowds can get extremely bad, so we decided to avoid this and paying the entrance fee. The valleys have great trails set up for mountain biking, and ranging from beginner to advanced. Mountain biking proved to be a great budget friendly option for the day. There are plenty of bike shop rentals around town, just make sure you find a reputable company and always test the bike before hand. 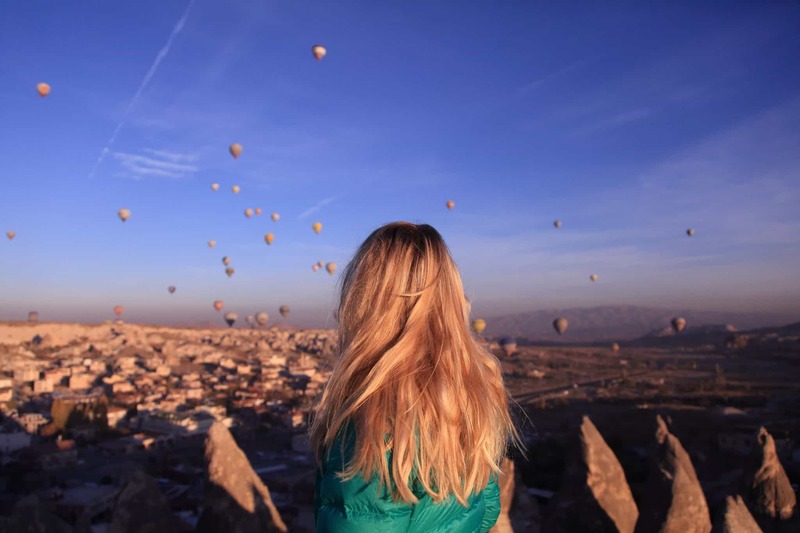 Cappadocia is smack dab in the middle of Turkey. You have two options to get out – fly or bus. We chose to take the night bus to Pamukkale with Suha bus company for 50 lira. The bus ride was 10 hours long and surprisingly wasn’t terrible. If you go with this option just note that all buses drop you off at Denizli, where you will have a free transfer to a smaller caravan to take you directly to Pamukkale.